WordPress.com is a weblog hosting provider owned by Automattic and there are over 71 million individual blogs with the service as of March 2012. With WordPress.com (not to be confused with WordPress.org) you don’t have to pay for web hosting or manage a web server and once you have registered your blog you can immediately start blogging. WordPress.com combines ease of use with nearly unlimited customization options to change the look and feel of your blog or website. The easy nature of publishing make WordPress.com ideal for any manner of websites and it is not uncommon to see websites with a Blog page alongside other pages, all created by WordPress.com. People with no experience with websites can easily start blogging and if they so wish, turn their blogs into websites with the knowledge gained. WordPress.org (as opposed to WordPress.com) requires a web host and server and you are required to upload all the software needed to run your blog. Technically WordPress.com is FREE, if you do not mind your blog or website (cringe!) displaying a sub domain e.g. http://myblog.%5Bwordpress%5D.com%5D as part of the address! In order to have the [wordpress] bit removed one has to subscribe to domain registration and mapping annually. Blogs on sub domains like .blospot.com or .wordpress.com lack the credibility that blogs on their own domains have because those on domains are less likely to disappear over night or to be spam sites. The cost of domain registration and mapping is $ 18 USD per year. This is peanuts however compared to what it would cost to get a self-hosted website…and you won’t get a monkey. All the fees listed below are optional upgrades. It is my humble opinion however that in order to give the blog a semblance of uniqueness, credibility and to associate it with your personality or even branding, at least consider upgrading the ‘Domain Mapping’ and ‘Custom Design’ options, costing a total of $48 USD per year. The upgrades can be cancelled when the renewal period rolls around – but you won’t want to. I have listed the cost breakdown above first, not to discourage new bloggers or business owners wanting to turn their blog into a website, but because WordPress inexplicably does not have this cost breakdown listed anywhere, or at least in a single-page summary format. It’s very easy to start a blog and WordPress.com is by far the best and as mentioned one can also build a website using WordPress.com like I did. I looked around for a long time before starting my blog and I am not sorry I chose WordPress.com. It is hosted by WordPress, so you don’t have to pay hosting fees as in the case of self-hosting. For self hosting you would need a WordPress.org account, and you do get more plugins and you will be able to monetize your blog or website through advertising etc. You can migrate to WordPress.org eventually, bearing in mind the increased cost of a dedicated server and the fact that you would have to pay someone to do SEO (Search Engine Optimization) for you as you cannot use tags. Tags are keywords or phrases that best describe your blog posts and show up in search engines, such as Google. My advice is to start with WordPress and slowly familiarize yourself with HTML code at a fraction of the cost of a self-hosted website, that can be costly to design, even more so when not opting for WordPress.org and outsourcing website design. Also remember that you’ll require broadband (or ADSL) internet connection to update info and upload large images. It took me about 6 months to understand all the features within WordPress.com and it is still an on-going learning experience 3.5 years on (2012). To have your own blog you need to register a new domain name, i.e. http://myblog.wordpress.com. To lose the ‘wordpress’ bit you have to upgrade to ‘Domain Mapping’ i.e. change to http://myblog.com which will cost additional money, but this is the only money you have to spend for the time being within the first 2 months of starting your blog at any rate. I recommend that you upgrade to domain mapping from the start. Then, if you eventually move to a self-hosted WordPress blog and you migrate your existing posts and pages to the new space, the posts will have the same URLs (web addresses, like https://vuthisa.com/…) without the ‘wordpress’ bit which are not displayed in WordPress.org blog posts (like https://vuthisa.wordpress.com…). This is important because Google and other search engines will have indexed the content of your site using those URLs. If the page address were to change, then the value of those indexed pages would be lost. Eventually the search engines would find the pages again, but your site rank would drop in the meantime, and your traffic with it. Using your own domain name helps you retain your site’s value. As mentioned the cost for using your own domain name for your WordPress.com is about $12 per year, a worthwhile investment and you’ll also have to pay a yearly fee of approximately $5 per year to register the domain name. Take note that WordPress.com blogs/websites do not have the ‘www’ prefix. If somebody places the ‘www’ in front of your blog address it WILL however still open. I always put the ‘www’ in front, on my business cards or email for instance, because it sometimes creates confusion. The next expense you would have to undergo is to create your own Header. This is the background picture displayed on every page of your blog. In order to upload your own header you need to upgrade to the Custom Design and CSS option which allows you to customize the fonts in your theme and change out the default header picture of the theme you selected originally. Contact your local graphic design company to create your header picture (CSS) or get some ideas by visiting the 5dollarbaby guys, pay $5 and see what they come up with (http://5dollarbaby.com/category/headers/page/10/). I designed my own header with GIMP (similar to Photoshop) and eventually taught myself to upload animated GIF files within my header. You can change your header design as often as you like, although if you are planning on attracting recurring customers it is always best to make subtle changes to your header design. With the Custom Design upgrade you can choose to apply your custom fonts or custom stylesheet to any of the themes available on WordPress.com. Some themes, like the plain but versatile Sandbox and Toolbox, are blank canvases waiting for your custom fonts, CSS and images. You need to learn some basic HTML, i.e. if you want to create tables or lists or need to start new paragraphs that simply won’t stick in WYSIWYG. All posts are written as WYSIWYG “What You See Is What You Get” and it is easy to change Font colors, underline etc., but there is a tab you can select to go into the code to make photos cling to paragraphs etc. if you struggle with WYSIWYG. I use this website: w3schools_examples and w3schools_try_it to preview my text or to learn HTML language. 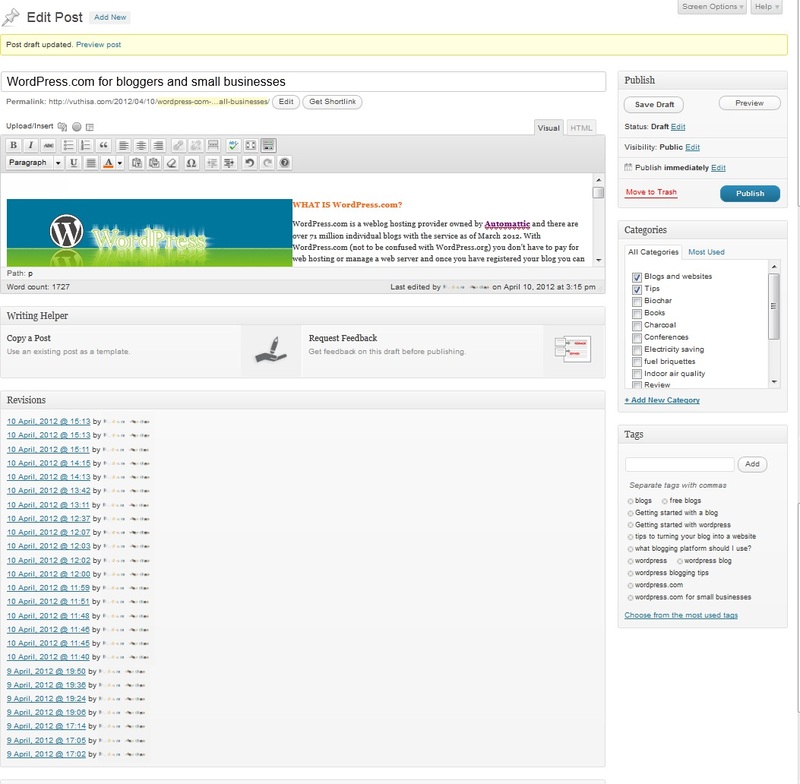 When putting up a new Widget in WordPress I preview the widget in http://www.onlinehtmleditor.net/. Widget is a fancy word for tools or content that you can add, arrange, and remove from the sidebars of your blog. Widgets make it easy to customize the content of your blog sidebar but WordPress does not have a preview pane for widgets. My advice would be to send out a few posts on a subject that you love to talk to people about or concerning a subject matter you are quite knowledgeable on and start educating the world! Submit the post to a blog carnival so that it can be read by a wider audience. People use Search Engines primarily because they want to empower themselves with knowledge. If your posts are interesting and informative and crammed with resources, more people will visit your posts or pages and refer to you in their own text links or on Facebook, Twitter and the like. If you’re battling with a HTML code issue or a glitch that you’re unable to fix, ASK A QUESTION and the WordPress.com volunteers will gladly impart with their time and knowledge on the WordPress Forums. They are able to go into your blog and fix wonky codes for free and they have saved me on more than a few occasions.